Our overwhelming conclusion is that South Africa can achieve its objectives when goals and strategy are agreed, the best public and private resources are mobilised and commitment is sustained. This website provides a summary of the work of the Business Trust along with access to the reports, publications, case studies and research produced by the Business Trust or its partners. From 1999 to 2011 the Business Trust combined the resources of business and government to accelerate the achievement of national objectives. It focused on creating jobs, building capacity and combating poverty in the early years of democracy. After 12 years it has fulfilled its mandate and completed its work. This report provides a brief description of the results achieved by South African companies and the government working together. The achievements are a product of the context in which the work was undertaken, the strategy that was adopted, and the partnerships that were built between 1999 and 2011. The new democracy, supported by a relatively well-developed market economy and substantial business sector, made the Business Trust possible. Concern about the pace of development and the role of business in society made it necessary. A political commitment to involve business in South Africa’s development project and an aspiration in business to be a trusted social partner made it desirable. • Identify areas where business and government could cooperate to accelerate the achievement of national objectives. Two five-year strategic plans were developed through a process of consultation between senior business and government leaders. • Develop a limited number of programmes to give effect to the strategic plans. Two broad programme areas emerged. The first was concerned with improving the provision of public services and the second with making markets more inclusive. • Forge partnerships with the government departments to oversee the implementation of the plans. • Appoint specialists to implement the programmes against annually renewable contracts. • Ensure independent audits and evaluations, and revise plans on the basis of evidence. • Support strategic dialogue between business and government, and communicate the results. Partnerships established to implement the strategy included: a corporate partnership of the companies that supported the Business Trust; a strategic partnership among business and government leaders to confer on national strategic issues; a governance partnership including cabinet ministers and corporate leaders to govern the organisation; and a range of operating partnerships among government departments, service providers and communities to implement programmes. • enhance the contribution of the private sector by attracting investment, developing enterprises and opening opportunities for more people to participate in the economy. 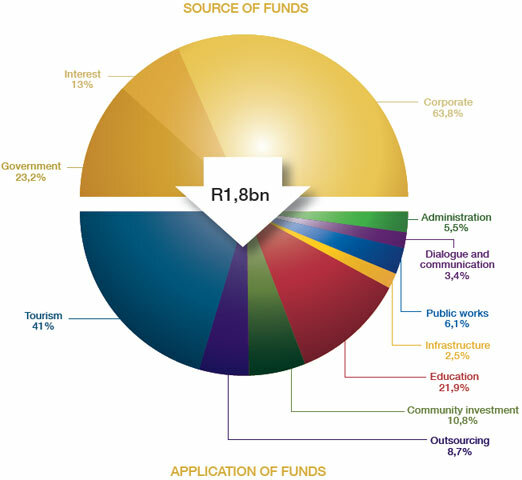 R1,8 billion was mobilised and managed by the Business Trust in support of government resources considerably greater than that sum. By working together, business and government were able to improve the lives of four million people. That included 600 000 work seekers who found income and work, 1,5 million learners who improved their performance, and close on 8 000 entrepreneurs who were assisted to expand their businesses. • a model for public private cooperation for the achievement of practical improvements in the lives of the poor. The R1,8 billion managed by the Business Trust was rapidly deployed on focused intitatives at the discretion of the board. Credit for the results of this extraordinary, cooperative effort must go to the 140 companies that were part of the organisation and to the government departments that forged the partnerships that produced the results. The Business Trust made an important contribution to South Africa’s development in the early years of democracy. It accelerated the achievement of some of the country’s most important objectives. It was a symbol of cooperative effort in a society historically defined by division and a model for getting things done at the interface of public and private action. Over the 12 years, R1,2 billion was provided by 140 companies in two funding cycles according to a formula based on company size. Interest on those funds amounted to R235 million. In addition, grants were received from government departments for the management of designated projects. The major areas of application were tourism and education, which together absorbed over 60% of the available funds. Administration costs amounted to 5,5% of the funds managed. The overwhelming conclusion of this work is that South Africa can achieve its objectives when goals and strategy are agreed, the best public and private resources are mobilised, and commitment is sustained. Challenges in education, employment and local development can be faced and overcome by working together. This cooperative effort provides examples of children in over 900 primary schools gaining a year in reading and writing ability, and in over 500 secondary schools showing a nine-fold improvement in mathematics results. There are models of how business and government worked together to expand employment in priority sectors like tourism and business process outsourcing with an extra 450 000 people employed in tourism and seven of the world’s top ten outsourcing companies now operating in South Africa. This work shows how private sector support can accelerate the implementation of public programmes like those for public works and the provision of infrastructure. It demonstrates how the commercial resources of the private sector can be used to meet the needs of the poor with investment contracts worth over R1 billion signed for one of South Africa’s poorest areas. New insights have been gained and important lessons learned. These are summarised in the following sections.